What Are the Five Most Intelligent Cats? The Siamese is the most popular shorthaired cat in America. While a cat’s intelligence is not necessarily determined by his breed, some breeds are known for their smarts. Researchers at Animal Planet have created a directory that ranks breeds of cats in several categories, including intelligence. According to this directory, five of the more intelligent breeds also possess curiosity, independence, playfulness and an affectionate nature. 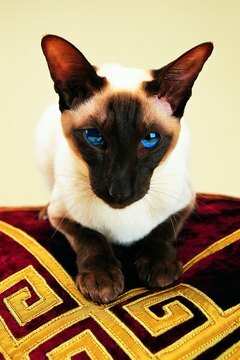 The Siamese hails from Thailand, and is one of the most recognized breeds of cat in popular culture. It is said that he developed his crossed eyes by staring at the valuables he was charged with guarding, and a crooked tail from carrying the rings of princesses. His large, pointed ears, slanted blue eyes and a short, smooth coat with white and chocolate, blue or lilac shadings, are among his other interesting physical characteristics. In addition to his noted intelligence, the Siamese is ranked high for his playfulness and affectionate nature. Named in honor of dancers from the Isle of Bali, the Balinese has a medium-length coat colored cream, chocolate, red or tortoiseshell. He has a lean, muscular body and a plumed tail. It is believed that his high intelligence allows him to relate to his owner’s moods. If you are having a sad day, he may meow incessantly in an attempt to “talk” you out of your bad mood. He can also learn tricks that an average cat might ignore, such as learning to fetch a ball. The Bengal originated as a cross between an Asian leopard cat and a domestic cat. Because of his wild-blood lineage, some cat fancier associations don't allow the Bengal in the show ring, though many do. The Bengal cat is a long, muscular feline with short ears. His ultra-soft coat has horizontal spots in colors such as brown, sepia and mink tabby. His intelligent mind keeps him curious about everything his owner is doing. He is playful and active, and unlike most domesticated cats, is known to enjoy swimming. The rare Havana brown sports a deep chocolate-colored coat as soft as mink. Arriving in England from Siam in the late 1800s, this intelligent cat is medium in length with a muscular build. His stunning green, oval-shaped eyes and large, rounded ears give him the appearance of being highly alert. Havana browns are ideal companions for those with a lot of attention to give. He will happily play fetch, and follow his owner endlessly. The need for human interaction is vital to his health and happiness. During the 1940s, cat breeders began selectively breeding the Siamese to produce nontraditional colors, resulting in the Siamese-like colorpoint. His short, glossy coat has a Himalayan pattern in a variety of colors, including red point, cream point and lilac. 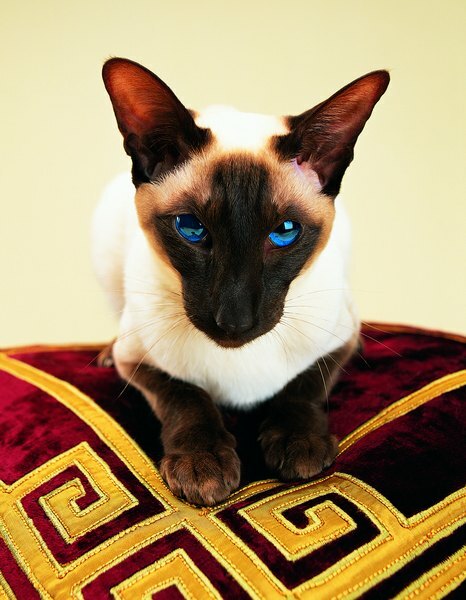 He has a long, lean body and the distinctive blue eyes of his Siamese ancestor. The colorpoint shorthair has a playful, vocal personality and enjoys affection.